Edible photos are becoming increasingly popular with bakeries these days, but we should keep in mind that this is not a cheap technology. In fact, it's quite expensive, what with the special printers, edible ink, and, of course, the moon dust and mithril-coated unicorn hair they use for paper. Wait. You're saying they *don't* use moon dust and mythril-coated unicorn hair for paper? Well, then, how do you explain...THIS? They reused the printer's test sheet. You know, Denis C., if the sheets cost this much, maybe they should consider just going back to Spiderman Head. But seriously, stop with the edible printing already. HOW DO THEY THINK THIS IS OKAY!?!? what does it say? and in what language? Well, at least it's not green. Hey, i'm trying to look on the bright side here. Although it's hard to overlook the strange lettering that's supposed to be the inscription--WTH does that say? One of the few times when recycling is not a good idea. And my WV is: trashi. Nuff said. But this cake is awful! How can they think that that was an acceptable thing to do! See now, this is why the one time I used an edible image (no WAY was I trying to make Strawberry Shortcake) - I ordered one of those assembly production kinds. And also why I try to make all of our decorated cakes myself. I'm perfectly happy with the grocery's triple fudge cake, but I know the people who work there - no way am I giving them free rein to make my occasion cakes! for my birthday this year, my 7 year old sister made a book of cheese she wrote as Stewart the minion from Despicable Me. on the back she wrote "alien message: translate it!" on the tester sheet of our new printer. it was pretty funny. Question: Was someone so desperate for this cake that they actually bought it? Where are his eyes?! His eyyyyyes?! For the love of all that his good and Marvel!! In what parallel universe does a baker look at that and go, "mah, looks good to me," and box that thing up?? I think Spidey saw himself in the mirror and decided to gouge out his own eyes. That's never a good sign. The worst edible pic ever? Life-size pic of the baby being baptised. "Er, uh, no thank you. I don't really eat cake." I can't see a cake with a pic on it now without flashing back to that horror. I suppose we should just be happy that they aren't using regular paper. Teacher lady... I think the language is Turkish. Behri Kerem is a name and the test is "1 year old"... roughly translated (thanks Google). But that begs the question... Did a kid brutally gouge out Spidy's eyes or did an adult?? I have to admit that if I were to stumble upon a wreck like this in a local store, I would purchase it (after the required 5 minutes of uncontrollable laughter) to appease the warped sense of humor which my family possesses. It's classic. vw: balisi - italian for ballsy, which is what this wreckreator was in producing this thing for sale. Is it just me or does it look like Spiderman has had his eyes gouged out? WV: inglyd- Maybe this is acceptable in Inglyd but not in North America! Ugh. It's totally my fault. Jen wrote Mithril and I told her to change it because I was sure that Tolkien spelled it with a y. The test sheet for the printer is made of edible paper, and not regular paper? Good god. Even my husband isn't this cheap! And why the cuss did they use edible paper for the ink test sheet?? Wow. That is just lazy at its highest form. Wow. I'm just excited I got an actual word. Crazy! Good God, people. If you're going to be so cheap as to re-use the test sheet, at LEAST flip it over and use the back. Oh and print your design the right size so that you don't have to cut off the word "Spiderman" on the spiderman cake. Oh and also don't gouge out any eyes. Scares the kiddies. Usually I read your blog and think 'haha, thats awful, haha', but today I actually said out loud 'that's AWFUL!' with disgust in my voice! And I'm in a room by myself. How is this ok??? I just got a new all-in-one printer/scanner by HP for christmas. Whenever I put in a new ink cart, it automatically spits out that same test page. So far I haven't found a way to make that stop, and I've accidentally printed on "good" paper twice. My guess is that someone loaded up the edible paper, put in a new ink cart, and that's what came out. This is no way excuses continuing to make the cake with it - just saying I can see how it would have happened in the first place. I sure hope they got a discount on that! I'm beginning to think all wreckreators are half deaf, half blind and full on stupid! Who would pay for that crap?!?! wv: oddisti - Wreckreators are oddisti-st to put customers through trauma like this. Poor kid that receive it, it's not because he is 1 year old that the parents won't see and care for the disaster! 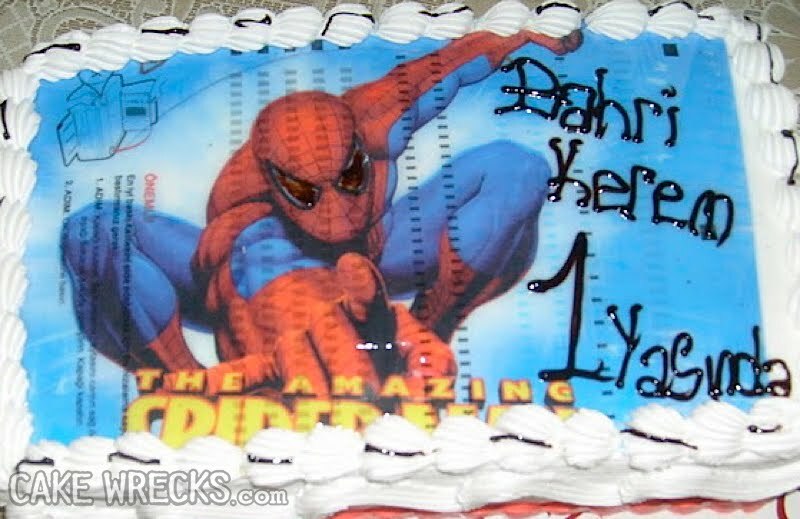 Now that we've established that the writing on the cake is Turkish: The whole idea of this is birdbrained and I would agree Spiderman's eyes are missing. Better for him not to see how this cake turned out to be a turkey! Why not use a piece of regular paper that is scratch for the tests?!?!?! That is what I do where I work. Lemmesee. The original webcrawler trying out the latest web print application. And not approving if the eyes are any indication. Not to be rude or mean, but I hope someone lost his/her 'job'. 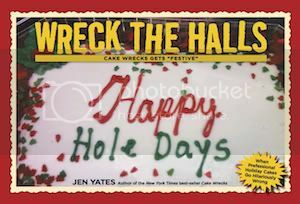 wv -- sneddles -- In a jealous rage over losing the favored sleep spot in front of the fire, Sneddles the cat snuck in and designed another cake for Snookums the dog. what makes the first picture worse is the quotation marks. if they weren't there i could hold onto the belief it was an innocent pear cake.... but now its a "pear cake". great Lord of the Rings reference! speaking of which, do you know where I could get some mithril? I honestly hope that the person that ordered that cake took the picture before they chased the wreckerator around the room with it. Honestly how much lazier can they get?? I am almost afraid to ponder that.. lol. I rather doubt mithril is edible. It might lead to a case of heavy metal poisoning. That said. I still can't think of any other reason to reuse the test sheet. Having read the comments, I now must make a second one. John's use of the word "poopsocks" just made me fall over sideways laughing until I wheezed and my eyes watered. This word simply must become part of my vocabulary. Incidentally, do you know how to go about extracting the mithril back out of the paper? It's hard to find a reliable source. These look so elegant and sound fabulous.Yum! I can almost smell it! How did they let this be sold?! I work with this stuff and it only costs about a dollar a sheet. Too expensive to use as a test sheet and too cheap to reuse on someones poor cake. It's not the decorator's fault that they make these cakes, that said, they should at least learn how to use the system correctly. Wrecked is wrecked. Poopsocks! What in the world makes these people think THAT is okay? Seriously, I would NEVER pay for a cake that looked like THAT... and i pity the person who does.